Ten years ago, in 2004, Debbie Calhoun was feeling a little bit of “empty nest syndrome” as the Christmas season was getting started. That inspired Calhoun to take her Christmas lights outside and set them up in her yard. Today, people still drive by the Calhouns’ home during the Christmas season and view the holiday light displays in their yard. But the displays have grown from “only about five or six” that were part of the first year’s lighting to a series of more than 50 displays that stretch one-eighth of a mile and contain roughly 26,000 lights. She’s also greeting people who come out to view the light display, stopping motorists to chat and hand out candy canes to kids of all ages. It all stems from her younger days, when she and her family would drive around to see Christmas lights on people’s houses. Calhoun, a woodworker, started out that first year with a handful of her own wood-crafted displays, making a carousel out of a “cable spool table,” a sleigh with reindeer and a Ferris wheel. But the one that got the most attention — and the most appreciation — was a “fan swing” crafted out of an old ceiling, a bunch of stuffed animals and a string of candy canes. 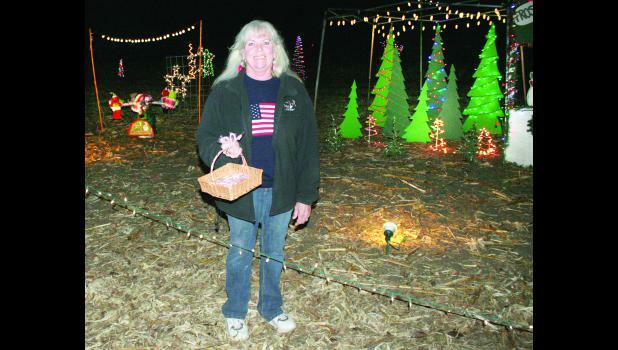 Calhoun’s Christmas handiwork inspired people to send her cards of thanks for putting out the light display — and that, in turn, inspired her to make more displays in coming years, depending on whether people would come out to see them. The displays generally draw people from Jackson and Atchison counties, she said, but they also tend to bring in people from the Topeka area — and even from farther out. “I’ve had people here from Finland and Switzerland,” she said. The growing interest in Calhoun’s light displays continues to draw people out to her home to view them, and people have noticed some changes in the displays through the years. One particular change that has benefited her, she said, involved switching to low-power LED lights. Calhoun accepts free-will donations to help offset the cost of powering up all those lights, but anyone who’s willing to donate more Christmas lights to her for future holiday displays is certainly welcome to do that as well. The light displays will remain on every night through Friday, Dec. 26, between 5:30 p.m. and 9:15 p.m. Motorists may also pull into Calhoun’s driveway to chat with her when they visit. “I’m the official elf,” she joked. To visit Calhoun’s Christmas light displays, take Kansas Highway 116 east from Holton to Larkinburg, turn south on Z Road/Allen Road (the Jackson-Atchison county line) in Larkinburg and drive one mile toward 222nd Road, then go west on 222nd Road about a quarter of a mile. The displays are open to the public. You really can’t miss them.